It’s Carnival Time in Richmond! 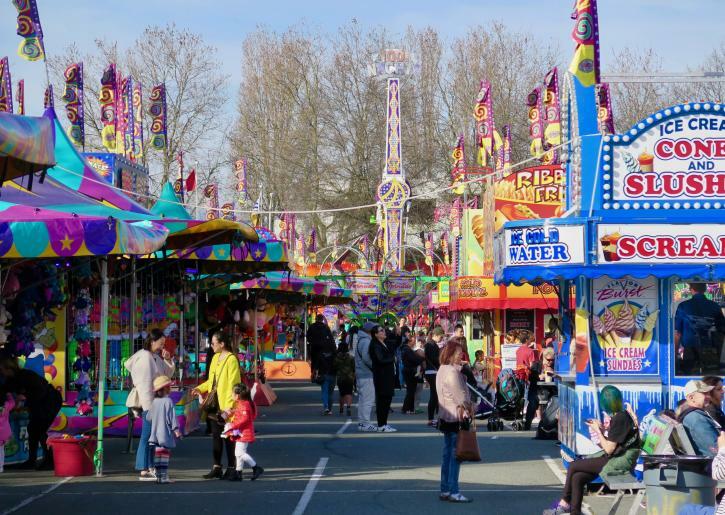 There are three sure signs of spring in Richmond: warmer weather, budding cherry blossoms, and the arrival of the Lansdowne Centre Spring Carnival. 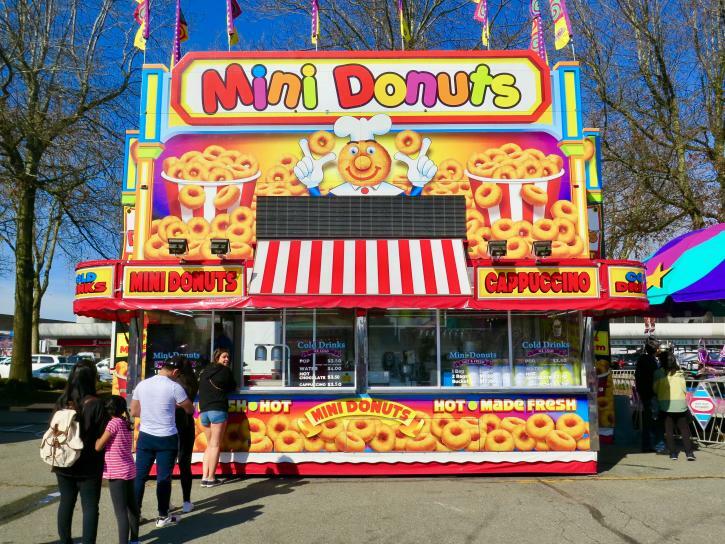 The annual pop-up midway is back again this year, taking over a corner of Lansdowne Centre’s huge parking lot with its neon-studded fairground rides, colourful games, and the kind of delicious comfort food that makes abandoning your diet a great idea. The carnival has just launched its 2019 season. But don’t wait too long to hop aboard the Zipper and the Ferris Wheel, win a car-sized unicorn plushy, or eat your body weight in corn dogs: you only have until March 31 to drop by. Not sure what to check out? On our visit, we discovered that there’s something for everyone here. Ease yourself in this year with a couple of comparatively gentle rides. The lofty Ferris Wheel towers over the site and gives you the chance to slowly check out the fairground from above. In contrast, the Vertigo—a tall, slender tower with swings twirling around it—goes higher and faster, triggering a few involuntary whoops as you kick your legs through the air. Both are ideal for families who want to take a ride together. Now that your stomach is primed for serious swirling, there are several ways to crank it up. Groans, giggles, and G-force are the adrenaline-fueled common denominators of rides like the Sizzler and the Tornado, where you whizz around and up and down in your seated car. We especially enjoyed the black-tentacled Spider, which whisks you like an egg in an omelette bowl. It’s the kind of ride your stomach wants you to stop but your brain can’t wait to get back on. Many riders aren’t content until they’ve had a chance to let a few screams out. And that’s the point of several of the attractions West Coast Amusements has brought here this year. Zero Gravity and the Starship 3000 churn you like a T-shirt on a washing machine spin cycle, while Super Shot eases you to a great height before dropping you (and eventually your stomach) like a stone. 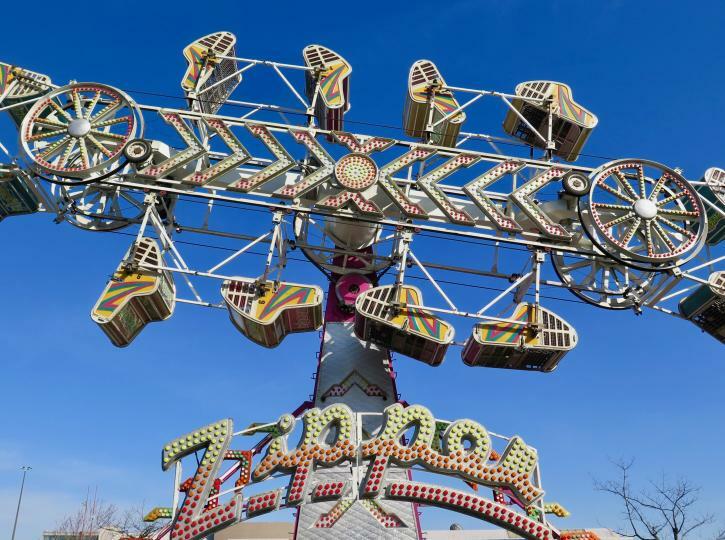 But it’s the Zipper that triggers the shrillest midway shrieks: who doesn’t want to climb into a tiny cage that tumbles, gyrates, and spins in the air? The best fairgrounds aren’t only about physical thrills. 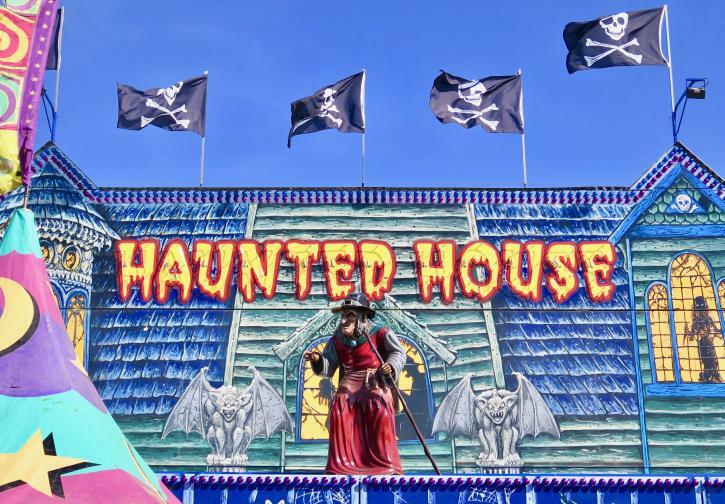 This year’s carnival has walk-through attractions such as the Mardi Gras hall-of-mirrors and the eccentric, obstacle-course Cuckoo House­­—complete with moving walkways, spinning beer barrel walls, and wacky Bavarian beer hall artwork. But it’s the Haunted House ride that calls many from beyond the grave. Guarded by a warty witch, your car careens through the inky blackness, passing pop-up zombies, mummies and vampires. Expect lots of screams and shrieks, not all of which are yours. 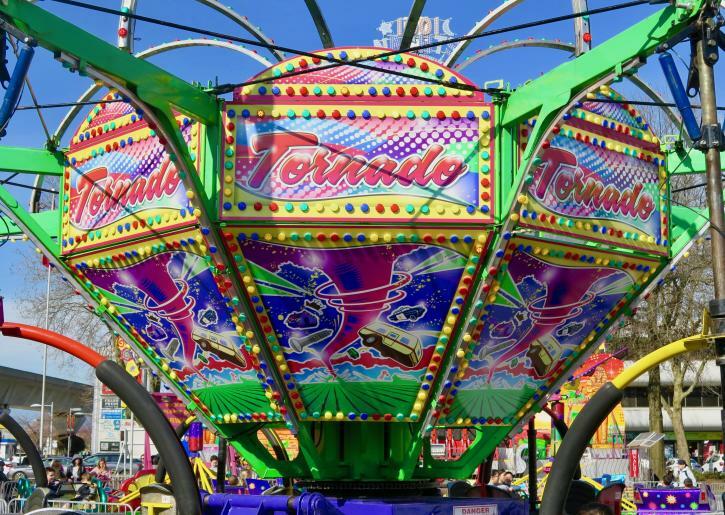 There’s a huge array of child-specific rides here, ranging from a Carousel to the Choo Choo Charlie train ride and the bright-red Berry Go-Round, where you climb inside a strawberry for a smile-triggering whirl. But the rides that make us wish we were six years-old again are the Monster Truck—a merry-go-round of chunky-wheeled SUVs—and Charlie Copter, where you pilot your own helicopter as it takes off, spins, and lands. For young kids craving quieter rides, head inside the mall where a small merry-go-round and an animal-themed train ride also await near the food court. To qualify as a proper midway, there should also be lots of opportunities to win big (and we mean big): from purple stuffed unicorns to humongous plush tigers and googly-eyed pandas, now’s your chance to impress everyone with your carnival game skills. 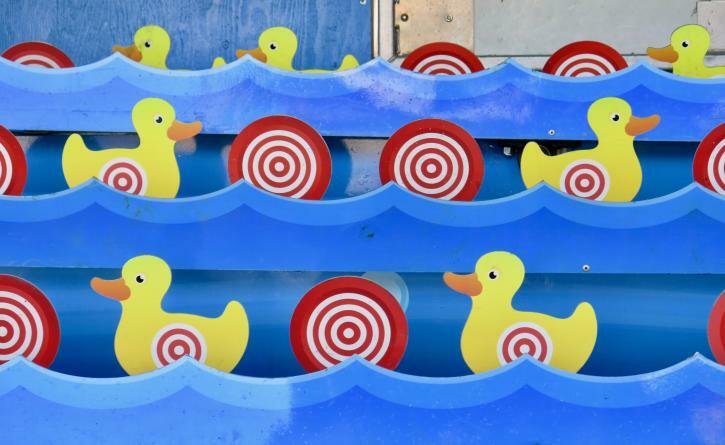 There’s a huge array of games to check out here, inviting you to shoot, bowl, hook a duck, dart a balloon, and more. Just remember that if you snag a stuffed donkey that’s the size of an actual donkey, you’ll have to carry it around all day. Carnival cuisine is also essential to your visit. Sidestep dinner and you’ll be able to (almost) guiltlessly nibble on poutine, chili fries, candy apples, cotton candy, corn dogs, and those freshly-made, must-eat mini donuts. Pro-tip: it’s probably best to visit the food stands after you ride the Zipper. And if you’re hungry for more substantial dishes, don’t forget that Lansdowne Centre’s food court and restaurants are just a short walk away and offer a full menu of options (keep in mind that hours may differ from those of the carnival). The Lansdowne Centre Spring Carnival is just a few steps from the Canada Line’s Lansdowne Station. Entry is free, while ride tickets cost $1.25 each—most rides require between three and six tickets. You can also buy 20 tickets for $23, 40 tickets for $45 or a daylong wristband for $40. In addition, there is a special six-ride package ($18.99) available from the Guest Services desk inside the mall. The carnival runs daily from March 21 to 31, operating from noon to 10:00pm (11:00pm on March 22, 23, and 30) and from noon to 7:00pm on its final day. Closing times are approximate and are dependent on weather and guest attendance.